During my time at the World Bank, we dove deep into what it takes to make things happen in the world, how experts translate their inner knowing into real-life impact. We discovered that when two or more people worked together on a common issue, all of the amazing and invisible interior know-how turned was turned into results. 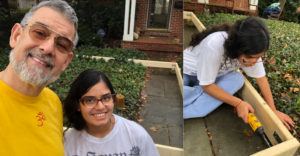 In the picture above my daughter, Ruchi, and I are standing in front of a small retainer that we built to hold our front yard garden. The old one had broken down over many years use and so we worked together to build a new one. I had to translate my knowledge of drills, electric screwdrivers, and carpentry into instructions she could follow. When we encountered problems, like how to balance the lumber so we got a good right-angle fit, she jumped in with suggestions and ideas. Together we found a rhythm, a way of exchanging information and cooperating on execution. In this particular instance, we got the job done faster than I thought we would with an extremely high amount of collaboration. It doesn’t always go like this! But, Sunday was a good day for us to work together. I know I took a lot of joy from just working side-by-side with her. I think that was one of the most important elements. By finding happiness in the experience as much as the outcome, the work went well. Who will you collaborate within the week ahead? What could you do to make it especially enjoyable?